The National League for Democracy (NLD) candidate for Rangoon's Mayangone Township has complained that she has been prohibited from campaigning for the upcoming by-elections at her local military barracks. “I tried to get inside quarters eight and nine where the infantry battalions were based for the campaign but the authorities would not allow it,” she said. “So I just left pamphlets at the gates of the barracks and the security told me that they would distribute them to the soldiers. Instead, May Win Myint's campaign team waited at a market outside the barracks where family members of army personnel went shopping in the morning. They then handed out NLD campaign material and spoke about their policies there instead. According to the township's Election Commission, all members of army families have to vote in advance on March 30 and 31 at the commission office. Dr. Saw Naing, who participated as an independent candidate during the 2010 general elections, said soldiers and their families are independent voters so political parties should have a chance to campaign and speak to them. “It's not fair that May Win Myint cannot enter the barracks and campaign there as she has that right by law,” he said. Mayangone Township has been the subject of many irregularities concerning the April 1 poll, with the names of dead people as well as those too young to participate discovered on the voting register. It is widely thought that civil servants and army personnel will be heavily encouraged to vote for the military-backed ruling Union Solidarity and Development Party who's leadership mainly consists of ex-generals. There are more than 130,000 people on the voter registration list in Mayangone Township with 177 polling stations. teaky... fakey, Army should be neutral, unbiased but they have right to listen, observed any campaign, not just usdp. NLD too, has a right to campaign. It is not APPROPRIATE TO FORCE CIVIL SERVANTS AND MILITARY PERSONNEL TO VOTE USDP IN FACT, IT'S CALLED ABUSE OF POWER N CHATING, IN ANY GIVEN DEMOCRATIC COUNTRY. TO REMIND YOU,IT IS NOT THE ARMY WHO DON'T WANT NLD, IT'S THOSE RANKING OFFICERS WHO FORCING SUBODINATES, ABUSING POWER N STEALING NATION'S RESOURCES. i like when you warn with "uniteneded consequences" are you say the Generals are staging to coupe????? CAMPAINING IS NOT A DIRTY JOB OR A CRIMINAL ACT. AS MUCH AS THE ARMED FORCES PERSONALS HAVE THE RIGHT TO VOTE, THE CANDITATES HAVE THE RIGHT TO VOTE; BE IT IS INSIDE OR OUTSIDE THE CAMPS WITH.OF COURSE, PROPER ARRANGEMENTS WITH THE AUTHORITIES CONCERNED. TO KEEP THE TATMADAW PERSONALS AND THEIR FAMILIES MEMBERS AWAY FROM NON-USDP CANDIDATES AMOUNTS TO UNFAIR AND BIASED ELRCTION. In any democratic countries, soldiers are allowed to listen political campaigners speeches at assembly hall or or in a suitable places within the military compound. 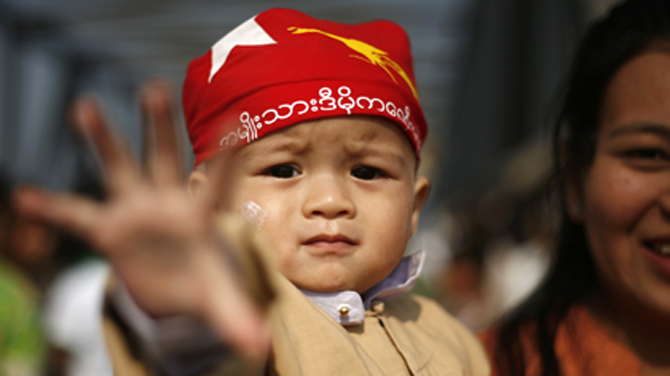 Why Burma military officials are so much scared of public to face it is a wonder. Is it what Thein Sein call "Free and fair election""
The NLD Candidates should ask for openness as a democratic right. But they should also be confident that the military personnel are mostly on their side as in 1988 and in 1990. I would like to remind people that it is inappropriate to politicize the army and the barracks should be out of bound for political campaigns. It should be enough to speak whoever they want to in the market or on the streets. Please remember what Bogyoke Aung San has warned not to dry out your stuff for cheroots on the streets only because the country is independent. If someone doesn't want you to come into their compound or house, you can't insist because that's a democratic country. The owners have their own rights. This kind of ignorance will only lead to unintended consequences.